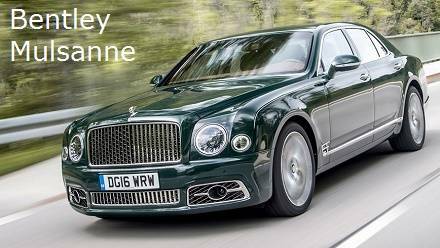 BENTLEY MULSANNE REVIEW: The flagship saloon combines opulent luxury along with scintillating performance. There is no denying the Bentley Mulsanne saloon has a very high buying price. But you have to agree that Bentley Motors is not your average car maker. Few automobiles ever get built this well. Having Volkswagen Group as the parent company ensures all Bentleys come with reliability. The 2016 Bentley Mulsanne saloon comes with exceptional fit and finish. In fact, every car is hand-built. Care and attention to detail gets emphasised even further when it comes to safety. Bentley Mulsannes are big and each model weighs around 2.5 tonnes. That size and strength has to make it a safer option for motorists driving Bentleys in the United Kingdom. A close inspection shows side-impact bars featuring inside the doors. It boasts an electronic tyre-pressure monitoring system that informs the driver if there is a sudden loss in tyre pressure. Bentley fit front, rear, head and chest airbags as standard. The Mulsanne gets its smooth power from a 6.75-litre twin-turbocharged V8 engine. That powerful unit produces 505 break horsepower. That said, the Bentley Bentayga SUV produces 600 bhp and 664 pound-feet of torque. An eight-speed automatic gearbox is standard on the Mulsanne saloon. Manual shift paddles help it tackle the twisty roads and British motorways. The latest Bentley models get LED headlamps and a wide conspicuous grille. The Extended Wheelbase model is 250 mm longer. This version provides even more comfort and lounge space in the rear. The Mulsanne runs on 4 cylinders while cruising. That is possible due to its cylinder-deactivation system on the V8 powerhouse. But, let's be honest, the Bentley Mulsanne requires a buyer with deep pockets. Even though the system cuts in and out with ease. It is difficult to claim the fuel economy figure of 17 mpg as frugal. The UK road tax rules designate the Mulsanne in the highest bracket. That means Bentley owners will see an annual bill over £500. Top speed on the Bentley Mulsanne is 184 mph. Statistics suggest you can accelerate from 0 to 62 miles per hour in 5.1 seconds. Any Bentley Mulsanne review would put that on par with many high-performance sports cars. The Bentley Mulsanne Speed model is even faster and more powerful. It has an extra 25 bhp and an acceleration time of 0-62 mph in 4.8 seconds. You will notice bigger wheels on the Mulsanne Speed and a sportier suspension set-up. Our Mulsanne road test rated the Speed model as a neat blend of ride comfort and handling ability. 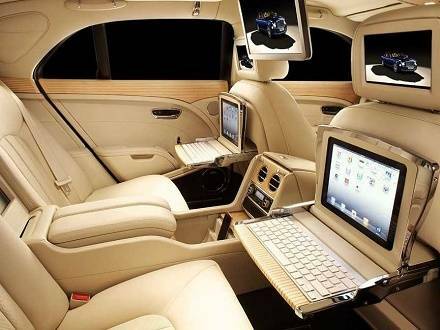 The interior is where the Bentley Mulsanne excels. It is a pure masterclass in British luxury. The prestigious saloon car features super-soft leather, genuine wood trim, and glass switchgear. The hefty price tag on the Mulsanne reflects the quality inside the hand-crafted cabin. It's where the driver and passengers get spoilt with power-adjustable front and rear seating. You get the traditional wooden dash and door trim along with leather upholstery and thick wool carpets. The independent air-conditioning unit adds to a sound-deadening environment. Prospective buyers of the Mulsanne get a choice of interior colours and finishes. Choose from 9 different types of leather which are available in 24 different colours. Acoustic glazing gets fitted to the doors and electric privacy blinds adorn the rear. Acoustic glazing gets fitted to the doors and electric privacy blinds adorn the rear. But, the high rear transmission tunnel inhibits the back seat. It is a squeeze to sit three 'large' people in the rear and travel in total comfort. A realistic Bentley Mulsanne review has to mention a very high purchase price. Add to that an up-market car that is expensive to run. But, how realistic is the cost and is there real value for money for buyers? Any high-performance saloon costing a quarter of a million pounds had better excel. But, the Bentley Mulsanne saloon is cheaper than several of its major rivals. It costs more that similar flagship versions of the Mercedes S-Class, BMW 7 Series, and Rolls-Royce Ghost. But the Mulsanne is less expensive than the Rolls-Royce Phantom.